Whatever you want to build in the gym, Magnum Primer® is your foundation. Without it you can’t build as much muscle, burn as much fat, or train with as much intensity. Why? Because Primer nourishes your body at the most basic level: the cell. There are between 50 and 75 trillion cells in your body. Each type of cell has its own lifespan – some last seconds; others, an entire lifetime. The nutrients you supply to each cell will determine its performance. Magnum Primer® was created to supply the best quality Pharmaceutical Grade ingredients in their most absorbable state to your cells. Our micronutrients and cofactors have been handpicked and carefully encapsulated to ensure maximum absorption. 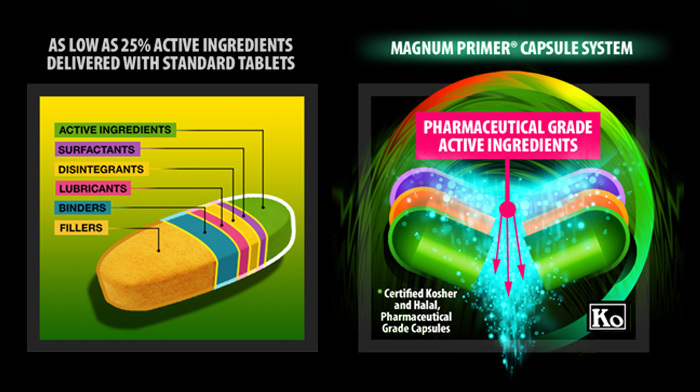 You will not find any compressed tablets in Magnum Primer® for a reason. Compressed tablets include excipients such as povidone (PVP), cellulosics, and modified starches, which are included as binders, disintegrants, diluents, lubricants, and surfactants in tablets. These inert ingredients can constitute up to 75% of a tablet and usually end up causing them to pass through your digestive system largely unabsorbed. 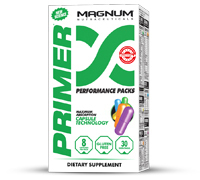 Magnum Primer® delivers it’s ingredients in a fine particle form in the natural shell of the capsule, this opens in the stomach in under 15 minutes, and when consumed with a meal as recommended, is transported completely available for utilization through the stomach and into the intestines, laying the foundation for muscular gains, recovery, health, wellness and anti-aging. Beyond absorbability you also have ease of ingestion. Two-piece capsules are smaller and smoother, with less foul taste, or smell of ingredients resulting in most people finding it a lot easier to swallow capsules over tablets. In fact, a recent study showed capsules were preferred over tablets by 90% of the participants.